This is a continuation of the PART I article dealing with utilizing native ecological infrastructure as it is meant to be engineered after a major land disturbance and in the process rebuilding through a series of important step by step processes which will eventually lead back to a pristine biodiverse ecosystem which originally existed on any plant community location. The above photo is of a visit we did last Sunday at a Public Estate Park called Gunnebo just outside of the city of Göteborg Sweden. Notice this is actually a prized remnant of Old Growth Oak Forest which for the most part is rare here in Sweden, yet once existed as a majority of old growth English or French Oak (Quercus robur) Forest which dominated all of Southern and Western Sweden a couple of centuries ago. Göteborg was very world renowned as a huge ship building location and wooden sailing ships were built as fast as the huge old growth Oaks could be clear cut without any regards to the forest's re-establishment. There is an area here of the city Göteborg called Masthugget which refers to an area where specific quality prized pristine Oaks grew so straight, narrow and tall as a result of the tight competition between trees for which such an environmental setting tends to shape and sculpt such trees into highly prized specimens for their valuable lumber potential. In this case, strong durable wooden Masts for the sailing ships was a priority. Most forests today in Sweden are Silver Björk (Silver Birch -Betula pendula) trees and Scots Pine (Pinus sylvestris). You may read about this here from a post on my other blog regarding what European Industrial forestry has done to nature from the reference I gave at the bottom or this link here. Let's go back and compare two photos from Cuyamaca State Park pine seedling growth and notice the differences. The first picture is how they all start out no matter where they germinate. But depending on the specific environmental conditions with which any seedling find themselves with regard to multi-species community of the protective nurse plant scheme cover or wide open range environmental situations, it can influence two radically differing growth patterns in nature. Take a look below at two entirely different growth pattern circumstances of the same species of pine tree. The one at the top is natural seeding in the open. Notice the stout structure with numerous branches ? Notice the second photo where brush has been mistakenly or irresponsibly cleared in an misguided effort to weed out the perceived choking competition of chaparral. This is truly a Rookie mistake. Notice the leggy appearance which for the most part has fewer branches than the top photo above it ? So out in an open environment, a pine like the same one at the very top of this post article, oak or any other type of tree seedling will first develop a stout stocky appearance with more branches giving it a bushier appearance as opposed to a tight closed canopy environment which will actually encourage a more concentrated rapid growth into the central leader bud of the pine with fewer side branches as is characteristic with the open area grown pine. The result eventually turns the pine into a pole like woodland habitat that was characteristic of the original old growth and it was this that Viktor Schauberger was referencing in his writing on Mother Trees or as we call them Nurse Plants. The results of allowing Chaparral to grow and cultivate along side and not against these pine seedlings would have re-created this open woodland park-like community as seen with this Jeffrey Pine community common in Garner Valley California, photo below. Eventually the Chaparral community would have served it's purposed programming and gradually yielded to the large shaded forest canopy. The picture I believe illustrates what I'm assuming the Cuyamaca State Park Caregiver's goal was in the first place. The question still remains however, who was in charge of all of this ? I know they have individuals with PhDs and a host of other credentials, so there was no reason for this other than a personal bias of outdated philosophy and ideology. If they wanted to recreate the below scenario, why did they deliberately throw a figurative wrench in Nature's machinery gear box and screw up the very mechanisms for which would have facilitated the very goal they wanted in the first place ? Let's get back to Rancho Cuyamaca State Park in San Diego County California. There are clearly example forms of how trees grow and shape themselves & each other depending on the environment which surrounds and influences them throughout their lives. 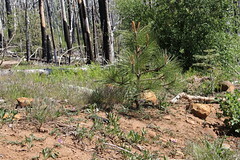 In the case of the mistaken US forest Service chaparral removal program, it left spindly leggy growth pines exposed & vulnerable to the harsh elements. This area is known for it's strong fierce winds at such high elevations and now there is a very real the danger of these trees being blown over. The chaparral and other scrub tree components were actually protecting, forming, shaping and sculpting so those trees into just such a future pristine forest the way it use to be. The Chaparral was also allowing the mycorrhizal networked grid to function, grow and maintain itself for the benefit of all plants by holding precious topsoil intact. Now this protection has been removed. Think of these little guys to the left as Mentoring Mushrooms. Young humans need guidance and mentoring in order to succeed and become healthy productive adults later on in life, so why not the young plants in a forest circumstance ? So what exactly are some of these componants that creates a successful old growth forest for which when you walk through it on a nature hike has the look of park-like setting ? Well, in this day and age it takes people understanding how the engineering works and for the most part not trying to force it before it's ready because we think we know what is best. In many cases it may mean hands off. At least if all the proper mechanisms are still in place. If not then some hands on may be necessary. Certainly these things will not happen over night, but they can look great after only a decade or so if we know the right areas to enhance, tweak and guide in the development. This first photo is on a hiking trail going up to Cuyamaca Peak looking down on Stonewall Peak across the valley. Notice not only the conifers, but also the great variety of other broad leaf trees both deciduous and evergreen. 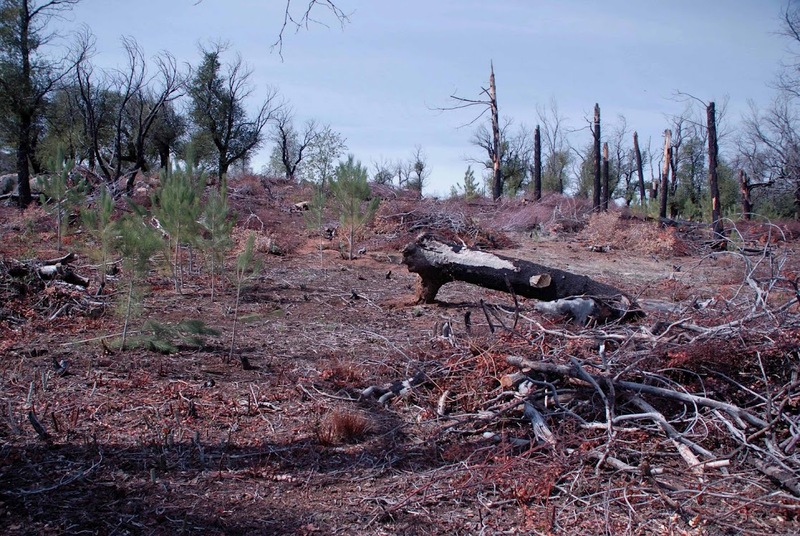 One thing that often mistakenly happens when rebuilding a forest here in the west is that only conifers will be considered when it comes to replanting. Broad leaf trees in my opinion are equally as important and in many cases more so for the fact that they are often more deep rooted than conifers and will actually support the conifer regrowth by means of hydraulic lift and redistribution of water deep within the subsoil when it counts during the hot dry days of summer through the mycorrhizal grid. I believe this is both Middle and North Peaks which are a part of the Cuyamaca Park system and this picture is prior to the 2003 Cedar Fire. 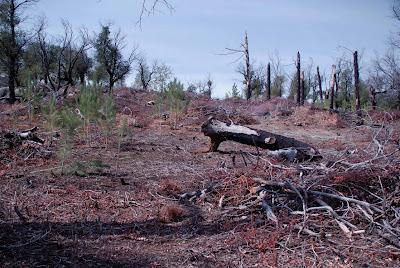 Below is a picture of the same area after the devastating 2003 Cedar Fire. What a contrast. In an instant, a Hunter lights a fire on a day of extremely dangerous Santa Ana windy weather conditions. His fateful decision change the face not only of Rancho Cuyamaca State Park forever, but 11 people lost their lives as a result of being burned to death from being trapped by rapidly racing flames that could not be out rub. The only other areas besides Cuyamaca State Park with the potential for such great diversity of life that I know of in San Diego County would be Palomar Mountain. [but even that has been attacked by fires caused by human stupidity] In Riverside County just north of there, the area of the San Jacinto Mountains in the North Fork San Jacinto River upper drainage basin for which Hwy 243 travels through from Banning to Idyllwild CA is very rich in a wealth of biodiversity. This obsession with failed conventional science-based monoculture replacement is killing our planet's natural world and whether people believe it or not also it's physical characters like climate and geological factors. Other important lessons can be learned from how a forest environment truly functions and gradually creates or re-creates itself. Unfortunately this tiny bubble of the average human lifespan tends to want and demand instant success or results now. I understand that completely. I often am pressured by my own human weakness of wanting things now when putting a landscape together in a yard where even an impatient client may want results quickly. It's a matter of human nature. That's why I often opt for 1 gallon plants as opposed to 5, 10 or larger containerized plants and it's a tough sell to clients with lack of vision. However, in such urban settings you can quite often get away with it. But some things as putting forests back together again need natural processes to work in a precise numerical order of events and this may take some time in accomplishing. Take a look at some pics I took over here just outside of my house on a trail leading from home to the Trolley stop. Take notice first of two completely different environmental factor situations under which a Norway Maple will grow. Aren't these kool. These are young Norway Maple (Acer platanoides) who in young under the guidance and care of the large mother tree infrastructure are in no real danger of falling over by wind storm or other damage, that is as long as the present situation is allowed to exist. In this next photo below is an example of a Norway Maple growing out in the open sky blue environment. Having no competition, guidance or direction, the juvenile gets and receives all that it wants, however it doesn't develop the same upwards climbing of it's central leader stem for which some time later will extend above the Pine/Birch forest only to replace them along with Oak trees. This was the forest of centuries ago. This tree below will develop into a stout shrubby multi-branched formless example and may never attain the great majesty of it's brother trees in the daycare forest circumstance. The exact same thing could be observed of the Oak Tree (Quercus robur) which is also more commonly found performing beautifully in an understory of Mother Trees as opposed to an open environment situation where multi-branching is the case as opposed to strong slender truck development which in the long run produces the better lumber quality tree. First is an example of a parent tree in these woods and there are not many. The next photo below shows the numerous juveniles planted by means of wind blown seed which flutters on the wind like little propellers far away from the original parent tree. Literally thousands of them will germinate, but with so much competition only a few will make it. Now the many young oaks which are being trained by all the adults. Yeah Yeah , I know, but I swear there's a ton of them (Oak Saplings) in there among the other plant vegetation. It's the kind of place you have to experience first hand. But you know, there were seriously lush locations like this in the Cuyamaca Mountains with Black & Interior Live Oaks. But wait, there is another important component I've not even touched on. One of the saddest and most unfortunate losses we have in the environment is that of modern day low animals numbers, especially herbivores. Clearly they are an important part of the regular pruning, shaping & sculpturing mechanisms or processes for which a forest understory is well maintained. This allows for smaller herbaceous plants to grow which are rich in food abundances for both animal and human needs. And it's not just the forest floor of the understory, but the actual thinning of the numerous healthy vigorous seedlings/saplings that need thinning. The competition is further reduced by their services for which the stronger trees survive. A long time ago I heard a lecture back in the 1970s revealing that a healthy forest actually looks more like a publicly well maintained City Park. Animals are the key to providing this continual maintenance service for just such a productive beautiful setting. It also takes pruning at higher levels of understory for a proper maintenance. These large animal numbers have dropped and one has to wonder what greater role they played in forests long ago in keeping the forest floor clear of debris which makes today's catastrophic wildfires burn so fiercely That is almost certainly impossible estimate or even to observe on a behavioral scale today. For that matter, we're talking any ecosystem no matter what the type. Even the great megafauna which once roamed the North American continent must have had some type of beneficial effect by their mere presence in the wildlands landscape. Of course in Sweden and I imagine other northern regions in North America, the Moose & large Elk plays a huge role in opening up dense forest understorys. It's unfortunate however, that Industrial Forestry is contributing to the elimination of even their once historical range. Very few are seen in the numbers they once were around the area I reside. 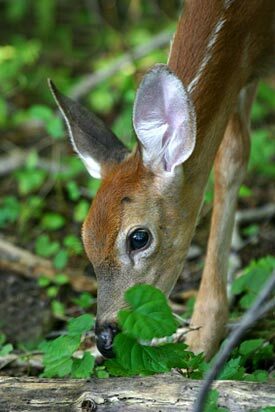 In almost ALL of the industrial forest land applications such animals are not to be found. The vegetation is so dense that even birds and squirrels cannot even be found there let alone a giant Moose by comparison. 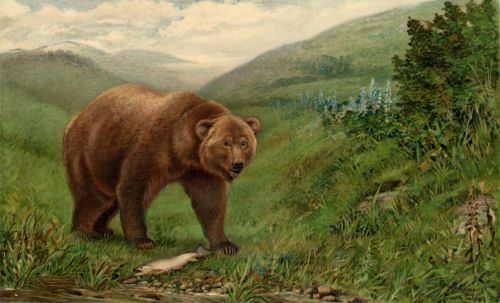 Richard Halsey of the California Chaparral Institute based in Southern California writes on his website of the contributions of the now extinct California Grizzly Bear. Not necessarily in the forested habitats, but that of the Chaparral Community. Rick Halsey has shown examples of what could have been former Cal-Grizzly game trails. One has to wonder what truly has been lost with this animal's present absence! 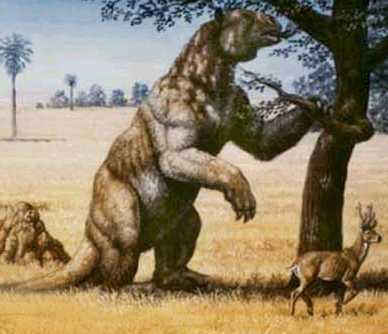 But then I also wonder about the possible role that the now extinct Giant Ground Sloths may have had as a residence of these Chaparral or Savanna habitats of the Southwest and beyond. How would they have shaped an ecosystem ? Does the environment really suffer as a result of their loss ? If they were around when even the early Spanish Explorers came to North America, [there is some serious evidence found recently from old Spanish outpost or fortress garbage pits to suggest Sloth animal bones among the others were present] they certainly would have been easy pickings as a human food resource if their name is any indication of their possible quiet docile nature ? Even the pic above illustrates a potentially important role of such an herbivore in Oak Woodland habitats. It is said to have even dieted on Joshua tree and Mormon Tea, both fairly rugged plants for any herbivore to assimilate and process. Yet evidence found in Arizona Caverns which have been found to be former Ground Sloth dens were found to contain large amounts of mummified dung from these animals which amazingly revealed their diet. Still, it makes one wonder, what was their place in the natural world and how did everything else around them benefit from their presence ? What about contributions of Pronghorn Antelope being at one time in the Southwest ? The list is endless as is the speculations of what once was and could have been now. More and more Home Gardeners are becoming disenchanted with the ways big business and big government have been handling matters from a health standpoint and are taking matters into their own personal hands - 'Good for them'!! "A Sci-Fi Classic That's Become Today's Reality"